Atradius explores how rising corporate debt in EMEs affects corporate creditworthiness and identifies the most vulnerable countries and sectors. 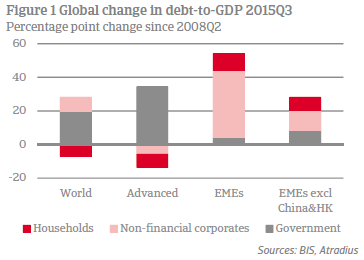 Corporate debt in emerging market economies (EMEs) has significantly risen, outpacing earnings growth. This is raising concerns about corporate creditworthiness given an increasingly challenging economic environment. EMEs shock absorption capacity is stronger than previous periods of global market turbulence, but some sectors remain vulnerable. Corporates that are highly leveraged, have borrowed externally in USD or have relatively low buffers are most vulnerable. These corporates are concentrated in Brazil, India, Indonesia, Russia, South Africa and Turkey. Corporates operating in the energy, mining, construction (materials) and transport sectors are also exposed. Companies in the real estate sector should be watched as well, as they generally do not hedge their foreign currency exposure. Global debt of households, non-financial corporates and the government – so called non-financial debt – has risen to 233% of GDP in 2015 from 212% prior to the 2008 global financial crisis. This reflects a very strong increase in the debt ratio of emerging market economies (EMEs) and a more modest increase in advanced economies. Whereas in advanced economies the build-up of debt has been mostly driven by government debt, the non-financial corporate sector was mainly responsible in EMEs. This rapid debt build-up in EMEs has raised concerns about the creditworthiness of its corporate sector given an increasingly challenging environment of sluggish global trade, low commodity prices, declining profitability, depreciating currencies and the normalization of US interest rates. And although it is currently not expected that problems in the corporate sector in EMEs will become systemic, as their shock absorption capacity is much stronger compared to earlier periods of turbulence on global markets, risks have increased on a micro level, depending on the sector and the country in which corporates are operating. In this Research Note we will put the developments in EMEs corporate debt in perspective and we will identify these areas of concern. Corporates in emerging market economies, particularly in the mining, energy, construction (materials) and real estate sectors, have significantly increased their borrowing in the period of cheap money following the global financial crisis. Their debt has risen by a staggering USD 15 trillion since 2008, surpassing USD 24 trillion in the third quarter of 2015. The average debt-to-GDP ratio widened by 40 percentage points to over 100%, which is well in excess of the average ratio of 86% for advanced economies. This has raised concerns at the multilateral organizations such as the IMF and the BIS. These concerns are just, but need to be put in perspective. By far, most of this increase is related to developments in China (and Hong Kong, which is part of Greater China). 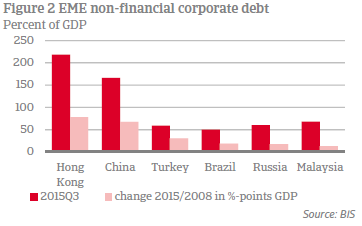 Excluding China and Hong Kong, the increase in EMEs non-financial corporate debt is more modest at 12% of GDP, to some 53%. However, this hides important differences between countries, in terms of the pace at which debt is growing and the way it is being financed. The rise in corporate debt-to-GDP ratios was most pronounced in Turkey, Brazil, Russia and Malaysia (see Figure 3, red bars). In all four countries the increase started from a low base and the debt level (light orange bars in Figure 3) remains moderate as a share of GDP. That said, in both Brazil and Russia, the recent increase in the debt ratio also reflects a contracting economy, which is generally not a favourable environment for credit risk. Seven important developments in the most recent borrowing binge stand out. 1) Increasingly leveraged balance sheets. This is particularly true for corporates in Brazil, India and Russia. The median debt-to-equity ratio of the most leveraged corporates in these countries (top quartile) ranged between 150 and 160 percent. 2) Unchanged share of external financing. On average EMEs corporates financed themselves predominantly on domestic markets (95% of total corporate debt for China, on average 62% for the other EMEs), in local currency (also 95% for China and on average around 70% on a residency basis for the other EMEs), mainly at the local banks. 3) External debt substantially widened. In some cases, it even outpaced growth of external receipts, making corporates in these countries more vulnerable to refinancing and exchange rate risk. This was particularly true for Brazil and to a somewhat lesser extent Indonesia, Russia, South Africa, Malaysia, Argentina and India (see Figure 4 which shows the countries with the highest increases in the external debt ratio). Argentina and Malaysia have significant buffers though, reducing their vulnerability. 4) Intercompany debt has increased. EME corporates have significantly increased their external borrowing through bonds (particularly Malaysia, Mexico and to a lesser extent South Africa) often issued by their overseas subsidiaries. 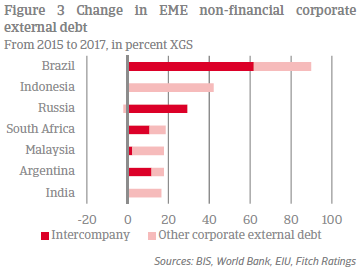 Almost half of the increase in external debt of EMEs corporates excluding China and Hong Kong reflects intercompany debt (notably Brazil, Russia, South Africa and Argentina; red bars in Figure 4). This debt is however less susceptible to refinancing risk (see box). External debt excluding intercompany debt better reflects corporates external vulnerabilities. This debt is highest in Indonesia. 5) External debt accumulation in non-tradables sector. Not only exporting companies raised their foreign external funding, but also companies producing non-tradables, most notably in local property markets and often intermediated through the domestic banking system (not included in external debt of corporates). These companies are more exposed to currency risk than companies in the tradable sector. 6) Weaker global commodity prices have significantly reduced the natural hedge of exporting companies. 7) EME companies in aggregate have become less profitable, particularly in the tradables sector as a result of weakening world trade and the decline in commodity prices. Based on these indicators, corporates in Turkey look most vulnerable, followed by Brazil, Indonesia and India. Corporates in these countries have relatively low external buffers, meaning that they have the highest net-external corporate debt position across EMEs and exposing them most to refinancing risks. To a lesser extent, this is also the case for corporates in Russia, South Africa and Mexico. Corporate refinancing risks are mitigated by large official reserves in Brazil, India, Russia and Mexico. These countries also experienced quite large currency depreciations since May 2013, when markets suddenly realized that the period of ultra-loose US monetary policy would be finite following the announcement of the US central bank that it would taper its bond purchasing programme. And although markets are currently in a risk-on mood, resulting in generally appreciating currencies, this could easily change again. To assess the specific vulnerabilities the above followed top down approach needs to be combined with a bottom-up approach, including information on corporate debt service, leverage, hedging and access to financing. The background on individual countries addresses these issues and also provides information on vulnerable sectors. Both level and composition of debt are important to determining debt sustainability. Generally speaking, external financing – i.e. by non-residents – is a less stable source than domestic financing, as it exposes the borrower to international funding crises and sudden stops in capital flows. Foreign currency borrowing is more risky than borrowing in local currency, as it involves currency risk, amplifying vulnerabilities to a shift in market sentiment. Bond financing is particularly sensitive, because bonds are tradable, unlike bank loans. Short-term funding is also more risky than longer term, as it increases the vulnerability to interest rate and refinancing shocks. Also note that external borrowing and foreign currency borrowing are not the same: EMEs are increasingly able to borrow on international markets and from international banks in local currency. At the same time, in some EMEs domestic banks lend in foreign currency. Most vulnerable are corporates that are highly leveraged (debt-to-equity), especially those having borrowed externally in foreign currency, at shorter maturities, with bonds that are not properly hedged and/or have low buffers. In this Research Note we have ranked the countries for which corporate debt figures are available based on information on (change in) corporate debt levels, the share of external debt, the composition of that external debt (securities, short term), and corporate external assets. Table 1 shows an overview of the indicators used per country. Where relevant, information on the currency composition, which is more difficult to identify as it requires firm-level analysis and differs depending on the source, will be mentioned. There are also external debt levels including and excluding intercompany debt, as this is relevant for determining the vulnerability of corporates to external shocks. Generally speaking, intercompany debt is less susceptible for refinancing risk than other sources of external funding as it has an equity like character. Ideally, we would have liked to include in the table the debt-service-to-income ratio, which is an even better indicator for assessing debt sustainability than the debt-to-income ratio, and information on leverage in the balance sheet of corporates, measured by debt-to-equity, as this is an important indicator for corporate vulnerability to shocks as well. But these indicators are not - easily – available. Where relevant, it will be mentioned and where available, information on the interest-coverage-ratio will be added. As a reflection of China’s expansionary monetary policy response to the global financial crisis, its non-financial corporate debt quadrupled to USD 17.4 trillion in the third quarter of 2015. At 166% of GDP, the debt ratio is one of the highest in the world after New Zealand and off-shore centres Hong Kong (part of Greater China), Ireland and Luxembourg. 95% of this debt is financed domestically and in local currency, and maturity mismatches are absent, according to Roubini Research. This makes Chinese corporates less vulnerable to a shift in market sentiment. However, both the level of corporate debt and the rapid pace at which it is growing increases the likelihood that the debt will become a drag on economic growth. Furthermore, the debt-servicing capacity of Chinese corporates has weakened substantially with the interest-coverage-ratio for the sector as a whole dropping from 8 to slightly above 3 between 2010 and 2014 (latest available data at the IMF) – one of the weakest among the larger EMEs. Default risk of state-owned corporates, that dominate the corporate sector, is in the short-to-medium term mitigated by the fact that they can keep getting bank loans or government support. However, this adds to excess capacity, which is spreading rapidly across sectors. Our base scenario is that Chinese authorities will avoid a hard landing and a domestic financial crisis. But excess capacity will continue to negatively affect corporate profitability and creditworthiness. This increases the likelihood that corporate debt will become a drag on economic growth since corporates will reduce their investments while credit is not being used effectively. Adding to this risk is the recent decision by Chinese authorities to facilitate the build-up of further debt, thereby encouraging corporates to reduce their already low external debt burdens in favour of local ones. Most vulnerable corporates in China are those operating in the steel/metal, coal and construction sectors. The shipbuilding, solar and textile sectors seem to be vulnerable as well. The rise of corporate debt in Turkey significantly outpaced economic growth in 2015. As a result, the corporate debt-to-GDP ratio more than doubled to 59% in the third quarter of 2015. Although the level is still moderate, the debt structure is concerning. Over a third of this debt is financed externally. The share of foreign currency debt is even higher as Turkish corporates, particularly in the energy sector, have extensively borrowed in foreign currency from local banks reflecting relatively high dollarization in the Turkish banking system. The exposure to foreign currency risk of Turkish corporates is thus higher than external debt figures suggest. Positively, financing mainly comes from banks, the Turkish central bank has recently taken measures to reduce dollarization of domestic lending and Turkish corporates have improved their maturity profile. But Turkish corporates are most exposed to refinancing risks, due to low buffers, including at the central bank. So far, Turkish corporates have good access to international capital markets with rollover rates of corporate external debt remaining above 100% and maturities being lengthened. Additionally, non-performing foreign currency loans to corporates from local banks are low and quite stable around 1%, much below the NPL ratio on loans in Turkish lira of around 3%. Most vulnerable sectors in Turkey are energy, construction materials, steel, transport (airlines) and chemicals. Most at risk are smaller sized firms with earnings mostly in local currency that are not sufficiently hedged. Also in Brazil, debt accumulation has outpaced economic growth over the past few years, first due to a relatively rapid increase in debt and most recently due to currency depreciation and the contracting economy. Since mid-2008 non-financial corporate debt increased to 50% of GDP in the third quarter of last year. Although the level is still modest, the increase, by 19 percentage points of GDP, is one of the strongest among emerging market economies. Moreover, the increase reflected a tripling of corporate external debt. However, this was mostly (60%) accounted for by intercompany borrowing, which now makes up over a quarter of total corporate debt in Brazil. Excluding intercompany debt, the debt structure of Brazilian corporates is quite favourable and financed predominantly domestically (80%), in local currency. Furthermore, non-intercompany external debt is financed at long maturities and mainly by banks. Also, two-thirds of the corporates that do borrow in foreign currency are adequately hedged (representing 90% of total foreign currency debt), mitigating the exposure to currency risk. Moreover, buffers of the country as a whole are large and official reserves are more than sufficient to cover the external refinancing need of the country as a whole. Brazilian companies’ debt-servicing capacity is weakening due to declining profits on the back of a contracting economy, rising interest rates and low commodity prices. As a result, the median interest-coverage ratio is at three times, relatively low compared to other EMEs. Additionally, the balance sheet is relatively weak compared to other EMEs. Brazil hosts some of the most leveraged corporates across EMEs, with a median debt-to-equity ratio of the top 25 percent at 160%. Most vulnerable sectors in Brazil: Leverage is particularly high and has increased most among firms in the transportation, infrastructure, heavy equipment and non-durable consumer goods industries exposing these sectors to liquidity and solvency risk. Small and medium sized corporates are the most vulnerable, particularly those operating in the consumer durables & electronics, agro-chemicals (particularly fertilizer producers), metal & steel and oil & gas sectors. Corporate debt in Indonesia is still low at 24% of GDP and overall corporate sector risks appear manageable. But a high share of external debt (75%, most likely fully in foreign currency) has increased its vulnerability to exchange rate and refinancing risks. Heavy borrowing by commodity exporters and also corporates in the non-tradable sector which outpaced growth of external receipts resulted in a doubling of the corporate external debt ratio to 80% in the third quarter of 2015. Not all of this is hedged, although the central bank is stimulating corporates to do so by raising the minimum hedging ratio (to 25% of their net exposure in 2016). Meanwhile, Indonesian corporates have relatively low buffers, while low commodity prices and currency depreciation have weakened their profitability and debt-service capacity. Some corporates have been facing debt repayment problems in recent months, notably on foreign currency denominated bonds. These defaults have soured investor sentiment toward USD denominated bonds issued by Indonesian corporates, which might negatively influence refinancing possibilities. At the same time, external refinancing needs are rising and are set to peak in 2018. Although official reserves are high, they are not enough to cover the external financing requirements of the country as a whole. Therefore, difficulties of Indonesian corporates in servicing their external debt could further increase. Most vulnerable sectors in Indonesia are transport, metals and steel sectors. India is among the countries with a sharp increase in corporate external debt, which has more than doubled, albeit from a low base The debt ratio is still moderate at 50% of GDP for total debt and 58% of exports of goods and service (XGS) for corporate external debt. However, net external debt of Indian corporates is relatively high compared to other countries in the sample; most of this debt is financed in foreign currency, predominantly in USD. Regulatory efforts by the Indian central bank has increased hedging from 15% mid-2014 to about 45% currently. But this still leaves 55% of corporates unhedged. Since the taper turbulence in 2013, the Indian rupee has however only marginally depreciated. External refinancing risks are somewhat mitigated by large official reserves, which are more than enough to cover the upcoming external refinancing needs of the economy as a whole. However, corporate debt is highly concentrated: the top one percent of firms in India accounts for about half of the debt, as do corporates in two sectors: infrastructure (including power, telecommunications and roads) and metals (including iron and steel). The composition of the balance sheet of these corporates is significantly worse than others in India. The median debt-to-equity ratio of these corporates has been at more than 175% since the global financial crisis, which is among the highest across EMEs. Most vulnerable sectors in India: infrastructure (including power, telecommunications and roads) and metals (including iron and steel). Corporate debt also rose at a significantly faster pace than economic growth in Russia. As in Brazil, this reflected first a rapid increase in debt and then a sharp currency depreciation (by over 50% since May 2013) and a contracting economy. As a result, the corporate debt-to-GDP ratio widened by almost 18 percentage points to 60% in the third quarter of 2015. More than half of this debt is financed externally, predominantly by foreign banks or by a parent company abroad. The latter accounted for almost 3/4 of the increase in Russian external debt. This mitigates external refinancing risks. So do high official reserves, which are more than sufficient to cover the external refinancing needs of the country as a whole. That said, the sanctions against Russia have cut off external financing for most Russian companies and have undermined debt servicing capacity of Russian companies through higher external borrowing costs and lower earnings. So did low oil prices and currency depreciation. The debt service ratio (for the private sector as a whole, so including households) almost doubled between end 2013 and early 2015 to one of the highest among EMEs, but is currently on a slight downward trend. Finally, Russia hosts some of the most leveraged firms across emerging markets, with a median debt-to-equity ratio of the most leveraged Russian corporates of 160%. Most vulnerable in Russia are corporates operating in the construction and real estate sectors, which generate mostly rouble income, but used to rely on foreign currency funding, and companies in the transport sector (particularly airlines and automobiles). Companies operating in the commodity sector are generally not highly indebted. But the Russian central bank warns that should the current situation in the commodity markets persist, coal, iron and steel companies and the mining sector might experience a rapid increase in their debt burden. In South Africa, the increase in corporate debt was in line with economic growth as a result of which the corporate debt to GDP ratio remained unchanged compared to its level prior to the Global Financial Crisis at a rather low 36% in the third quarter of 2015. But the share of external debt doubled over that period to 59%, outpacing the growth of export receipts. And although over half of the increase is related to intercompany debt, the composition of the remaining corporate external debt is relatively risky as a third is financed with bonds and a quarter short-term. This exposes the non-multinational corporate sector to currency, interest and refinancing risks. 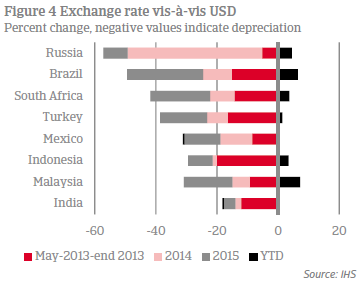 The South African rand is among the currencies hit hardest: it depreciated by some 40% since May 2013. Meanwhile, external buffers are relatively low compared to other EMEs, particularly of the country as a whole. Declining profits are negatively affecting debt servicing capacity. The interest coverage ratio of the corporate sector as a whole is on a declining trend, but still at a healthy level. However, this is not the case for corporates operating in the mining, electricity, gas and water supply sectors. To a lesser extent, corporates in the transport and communication sectors are vulnerable as well. Most vulnerable sectors in South Africa: mining, electricity, gas and water supply and to a lesser extent transport and communication. Although corporate debt in Mexico only moderately increased since the global financial crisis and its level is low at 25% of GDP, its composition exposes Mexican corporates to refinancing and currency risk. Three-quarters of the debt is financed externally, predominantly in foreign currency. Since the global financial crisis the share of bond financing has significantly increased, to over two-thirds, among the highest across emerging market economies. State-owned companies Pemex and CFE (electricity) accounted for one third of total foreign currency corporate bond issuance in that period. However, this rapid increase in bond issuance has been, in part, used to reduce funding costs and lengthen the average maturity of corporate debt. The latter somewhat mitigates the increased refinancing risk stemming from the high share of security debt. Further mitigating risks, Mexican corporates have high buffers: the corporate sector as a whole is only a small net external debtor and is marginally leveraged after accounting for cash holdings (ratio of total debt minus cash holdings to equity roughly unchanged at 46 between 2008-2014). Moreover, official reserves are more than sufficient to cover the external refinancing needs of the country as a whole. Debt service is very low and debt servicing capacity strong for most corporates, despite declining earnings and profitability due to the low oil price and exchange rate depreciation (by some 30% since May 2013). Stress tests conducted by the IMF show that the sector as a whole is resilient to interest rate, exchange rate and earnings shocks. Most vulnerable sectors in Mexico: generally speaking, large firms are more vulnerable than small firms, as they tend to be more leveraged and have weaker interest coverage. Particularly vulnerable are firms operating in energy (Pemex and CFE), chemicals, construction, and metals, especially steel, and companies in the supply chain of Pemex.